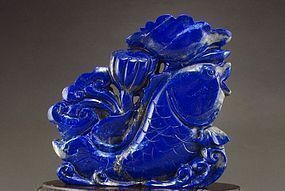 A natural high grade LAPIS LAZULI carved on both sides, depicting a Fish and a Lotus Flower, without a base. Good workmanship, good even color! Size: 103 x20 x 111 mm., weight 381 gr. Good condition. 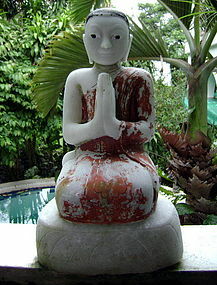 Rare Burmese 18th Century Shan State hand carved white Alabaster Disciple in adoration. Solid and heavy piece. Polychrome with some discoloration due to age, condition: good. 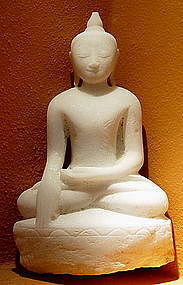 Size: H. 20" x W. 11.5" x D. 7.5"
Rare sparkling White Marble Carving of Shakyamuni Buddha, subduing Mara, 19th Cent. 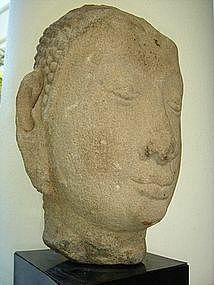 Burma, Good condition, (only tiny tip of Usnisa chipped). Size H. 33 cm x W. 20 cm x D. 6 cm excluding stand. This item has been nicely mounted on a black stand. 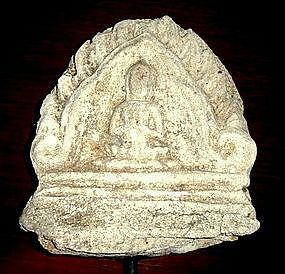 Very rare stucco stele - cornice depicting praying thepanom angel on both sides, surrounded by flame motif. 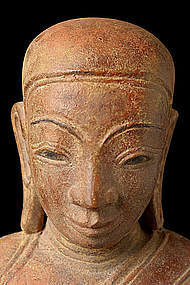 circa 17th Century, Thailand. This item has been nicely mounted on a black Museum Stand. Condition: good, some ageing due to considerable age. size: 22 x 19 cm excluding stand. Further photographs available upon request. 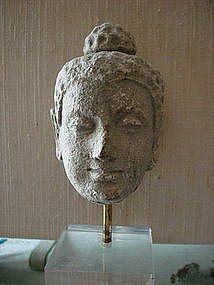 Gandhara Stucco Head of Buddha, 3/4th Century A.D.
Gandhara Kingdom stucco head of Buddha mounted, 3/4th Century, condition: good, left ear damaged and a few inconsequential nicks, common considering the age of this fine sculpture, size" H. 12cm x W. 8cm x D. 11cm. 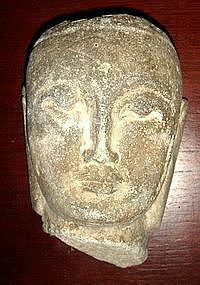 The idealized style is reminiscent of Greek Hellenistic sculpture which strongly influenced the Buddhist imagery of Central Asia and in particular of Gandharan artists. 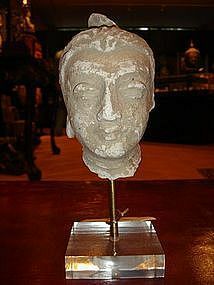 Fine Stucco head of Buddha mounted on base, Gandhara Kingdom, 3rd/4th Century AD.,size: H.15cm x W. 8cm x D. 8cm.